Despite countless threats, the U.S. stock market keeps grinding higher and is now within striking distance of all-time highs. Not only that, but as of Tuesday's close the S&P 500 had gone 42 trading days without a decline of 1% or more. That's the longest stretch without a big drop since a 66-day period that ended in July 2014, according to FactSet. It's a pretty impressive period of calm compared with the market chaos of early 2016. During one particularly scary stretch in mid-February, the S&P 500 suffered three plunges of 1% or more on separate occasions in just five days. The Dow had shed an incredible 1,974 points on the year during that time. Flash forward to today and the U.S. stock market hasn't dropped by 1% or more since April 7 and CNNMoney's Fear & Greed Index is in "extreme greed" territory. That's in the face of countless obstacles: a lingering profit recession, slowing U.S. job growth and the looming Brexit referendum in the U.K. later this month. That's to say nothing of predictions that a Donald Trump presidency could trigger a recession or at least a big market plunge. In fact, the S&P 500 is currently sitting roughly 1% away from the key 2,134.72 level. If it gets above there, the benchmark U.S. index will set a new record -- its first in more than a year. "I'm quite confident we're going to break through there, probably sooner, rather than later. We're going to test this thing pretty quickly," said Scott Wren, senior global equity strategist at the Wells Fargo Investment Institute. Michael Block, chief strategist at Rhino Trading Partners, wrote in a note that the 2,134 level on the S&P 500 is "feeling inevitable" and could turn into a "melt up." However, like many others who hate to chase a rally, Block is skeptical of the stock market's staying power at these heights, especially given all the challenges. New record highs "should eventually present the best selling opportunity since last summer," Block wrote. That may prove to be true. But history shows it's a good sign when the market takes its time before breaking into new highs, like the recent stretch. Bank of America Merrill Lynch crunched the numbers and concluded the implications are "very bullish" when this happens. 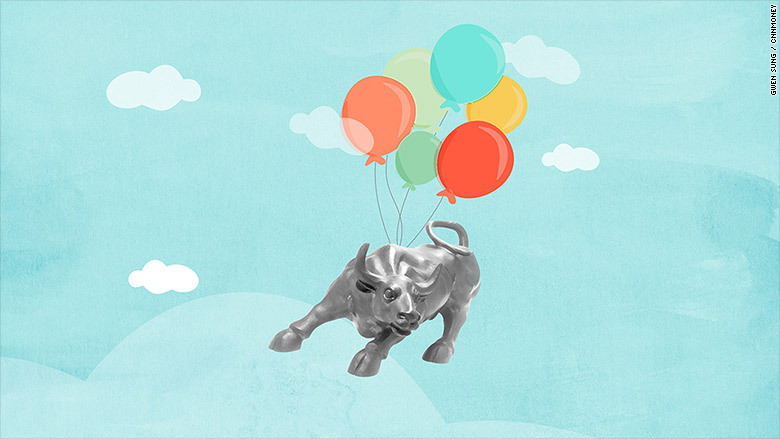 The bank said there have only been 23 times since 1929 where the S&P 500 hits a new 52-week high after going 300 or more days without one. (This time, it's been 382 calendar days without a new high as of Monday). Almost every one of those 23 instances were followed by positive gains. In fact, the S&P 500 has generated an average return of nearly 16% in the 250 days following the milestone, Bank of America said. Or as BofA sums it up: "New highs should not be feared." That makes sense. Stock market veterans like to see these so-called periods of "consolidation" because it validates the recent gains without letting the market run away from the fundamentals. By contrast, episodes of extreme enthusiasm can create unsustainable bubbles that end in tears. Just look at the dotcom mania of the late 1990s that eventually imploded. "You can't go up forever. You've got to take a breather, even if it's a 12-month breather," said Wells Fargo's Wren. Wells Fargo is calling for the S&P 500 to continue rising and end the year between 2,190 and 2,290. The high end of that range translates to a gain of 8% from current levels. Wren believes the recent market upswing makes sense because "valuations are not stretched," modest economic growth has proven to be "dependable" and the Federal Reserve isn't in a rush to raise rates. "You'll continue to see the market grind higher. If only we get a little bit of retail enthusiasm and we might see this thing push even higher," said Wren.